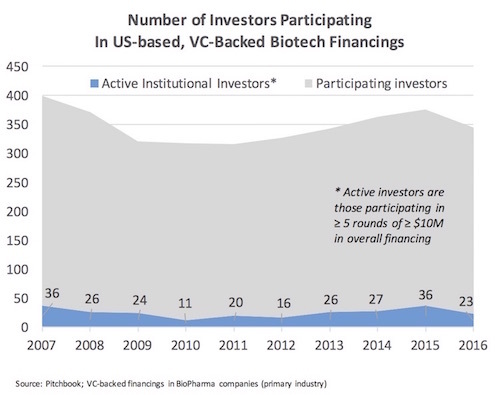 Despite the volatility of biotech stocks in the public markets, the VC-backed private biotech ecosystem has been in remarkable equilibrium for much of the last decade. ·qui·lib·ri·um. noun. a state in which opposing forces or influences are balanced. As I’ve noted in the past, the pace of new venture formation is roughly balanced with the exits from the ecosystem – whether that be via IPOs, M&As, or shutting down. Rather than focusing on the changes in funding levels, the number of companies getting financed is a better metric of changes in ecosystem activity. The chart below captures updated data on the decade-long balance we’ve witnessed on the private side despite the up/down excitement in the public markets: a financial crisis in 2008-2009, a multi-year bull run (2010-2015), followed by retrenchment (2015-2016) in the public markets. 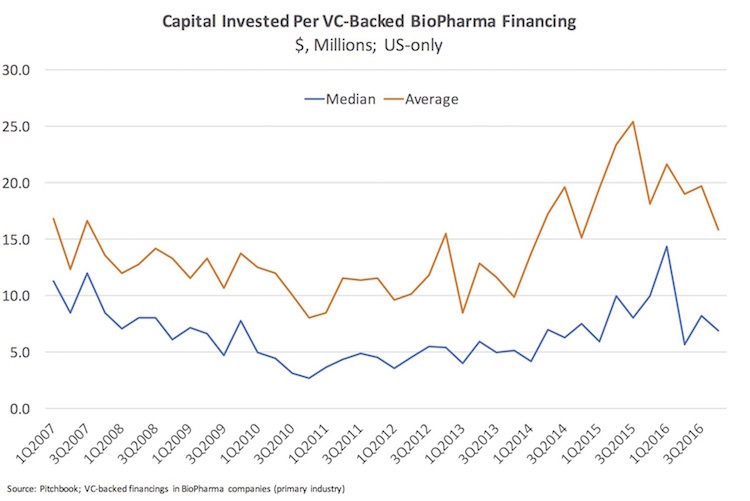 In aggregate, 400-500 VC-backed biopharma companies get financed every year – relatively consistently for the past decade (green line), especially in the latter half of that. The rate of growth in company financings across the decade is close to inflation and population growth, not metrics of dynamic change. And 30-40 new biotechs get formed and funded each quarter, a reasonably steady pace of venture formation. It’s worth noting that these absolute numbers are slightly higher/different than in past blogs; these small changes are due to the fact that the NVCA shifted from Thomson to Pitchbook as its core data analytics platform – and these data reflect analyses of the latter’s database. The relatively flat top-line of the chart, especially since 2012 in particular, suggests that this pace of formation is balanced by the exit environment. If it wasn’t, we’d see big changes to the overall number of companies getting funding since biotechs are typically equity-hungry, loss-making enterprises, e.g., if fewer exits (including positive and negative outcomes) were occurring than first financings, you’d see an increase in the aggregate pool of companies requiring financings over time. This relative balance is likely due in part to the relatively few institutional investors active in biotech; the limited number of qualified and well-capitalized investment managers is a real (and likely healthy) constraint preventing the over-heating of the system. The chart below highlights the number of active investors, again using updated Pitchbook data. The term “active” here is defined as any investor that participates in more than five financings of at least $10M in total funding in any given year. As shown, this number has been in the two dozen range for most of last few years. The total number of participating investors (which includes both institutional and individual investors) in any round of any size into a biopharma company is the gray backdrop. As is clearly evident, truly active investors are a tiny portion of the overall investor universe. Even fewer investors are active backers of “new” startups, by looking at the frequency of participation in “first round” financings. In 2015 and 2016, according to the data at Pitchbook, only eight firms did more than five first-round financings in at least one of those years: Atlas, Arch, Avalon, F-prime, Flagship, Novartis, Third Rock, and Orbimed. 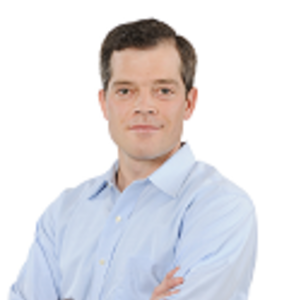 The early stage, venture creation investor universe is incredibly small. 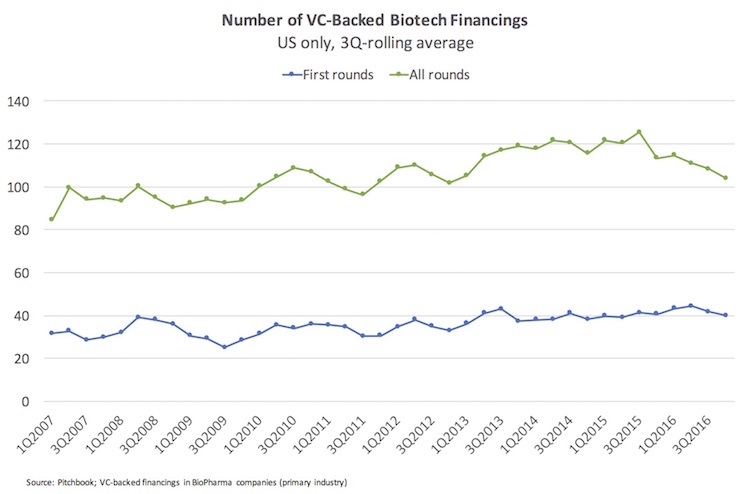 Lastly, although aggregate venture funding levels in biotech went up in 2013-2016, the number of financings (first chart above) was relatively constant. This led to a spike in the average invested capital per financing, and a more muted spike on the median (note that Pitchbook typically tracks the amount actually invested in a tranche, not the total “press release” financing). In fact, in the past three quarters, the median invested has reverted to levels below 2007. It appears as if the drive to bigger financings (or, more specifically, bigger tranches of financings), which unsurprisingly peaked at the same time as the all-time-high of the NASDAQ biotech index in 2015, has abated somewhat. I suspect in the long run this more restrained or capital efficient funding environment will reinforce the health of the sector (and prevent it from getting out over its skis with regards to over-capitalizing startups). Taken in aggregate, these data support an ecosystem in a healthy equilibrium – a constrained supply of new startups, with adequate and relatively steady funding levels, and matched by solid downstream demand for innovation. Read our June 2017 issue.